The discovery of two unusual copper oxalates happened almost by accident during a trip to an old mining site near San Lugano, Italy in September 2013. The small mine located in the Val Gardena Sandstone is best known for its discrete micro-samples of malachite and azurite. To make the trip worth their while, Francesco Demartin (Università degli Studi di Milano, Italy) and his friends Italo Campostrini, Paolo Ferretti, Ivano Rocchetti, and Stefano Dallabona had a stroke of inspiration and decided to sample fragments of coalified wood mixed in the sandstone outcropping. The carbon levels at the base of this rock formation in Western Trentino are well documented, and this formation was the subject of a brief but intense period of mining research during the first half of the 1950s, when interest in uranium for energy and military purposes was surging. Some of the coals were mineralized, and tiny, yellow-green crystal tablets proved to be copper arsenate minerals zeunerite and metazeunerite, but ultimately it was a mineral with a beautiful light blue hue that captured the team’s attention. Preliminary screening by Raman spectroscopy — a procedure that characterizes the typical first step of mineral documentation work — presented a well-defined spectrum with no plausible matches in in the RRUFF mineral database, suggesting that this intriguing mineral demanded further review. Thus, began a lengthy analysis that ultimately ended in disappointment in February 2017. The sample was eventually identified as middlebackite, a copper oxalate discovered at the Iron Monarch quarry in the Middleback Range of Australia and approved by International Mineralogical Association just a matter of months before. After the disappointment of narrowly missing out on what would’ve been an Italian-type locality, the group decided to return to the mine. In summer 2017, they collected other samples presuming they were middlebackite. This time fortune was in their favor. The Raman analyses used to distinguish middlebackite from the most common copper sulfates revealed that some of the samples had a Raman spectrum slightly different than the others. The researchers began to suspect they had something altogether unique on their hands. 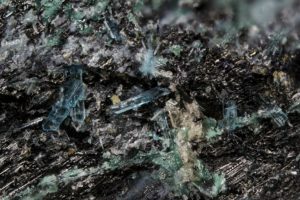 After a preliminary Scanning Electron Microscopy / Energy Dispersive X-Ray Spectroscopy (SEM/EDS) screening disclosed that carbon, oxygen, and copper were the only constitutive elements, a new single crystal diffraction experiment was needed. The results ruled out middlebackite, as was already suggested by the Raman spectroscopy, and indicated the mineral was an unknown dihydrate copper oxalate. Demartin and his co-authors presented their proposal for the new species to the Commission on New Minerals, Nomenclature and Classification, naming the new carbon-bearing mineral fiemmeite in a nod to its area of origin, the old mine located in the lower part of the Val di Fiemme in northern Italy. The type specimen of fiemmeite is deposited at MUSE (Museo delle Scienze, Trento).